Whatever your mother language, Dux encourages you to improve your English. “Practise, practise, practise!” is a phrase you have heard over and over. Why? Because English is the language of aviation, business, computers, diplomacy, science, and tourism the world over. Proficiency in English is part of applications to study at most of our tertiary education institutions. The ability to speak English increases your chances of getting a good job in a multinational company within your home country or of finding work abroad. "Africa : SOUTH AFRICA". CIA The World Factbook. 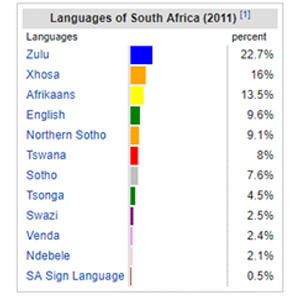 South Africa boasts 11 official languages, but our northern neighbour, Zimbabwe, beat us into the Guinness Book of World Records with 16. While each learner is different, some of the languages regarded as “easy” to learn include Afrikaans, Italian, Norwegian, and Spanish. Those regarded as “medium” include Greek, Russian, Thai, and Turkish. Languages regarded as “hard” to learn include Arabic, Chinese, Japanese, and Korean. Local language refers to the language spoken in the homes and marketplaces of a community, as distinguished from a regional, national or international language. Indigenous language refers to the language spoken uniquely by an indigenous community and/or with origins in a given community or country (Spolsky, 2002). Given the nature of language change, however, many ‘indigenous’ languages do not actually meet this definition. The languages of First Peoples communities of the Americas are often referred to as indigenous languages. National language is used in some parts of the world (including sub-Saharan Africa) to refer to languages unique to the nation as distinguished from international languages (cf. Tabi-Manga, 2000). In other countries, ‘national language’ refers to the official language (Bamgbose, 1991). Th is report uses the first definition. Mother tongue or mother language refers to a child’s first language, the language learned in the home from older family members. (See UNESCO, 2003, p. 15 for a more extensive definition.) In some places, the term has taken on more of a culturally symbolic definition, so that an individual might say, ‘I don’t actually speak my mother tongue’. A related term, home language, refers to the language or languages spoken in the student’s home. Minority language refers to the language spoken by a numerically smaller population and/or to the language spoken by a politically marginalized population whatever its size (UNESCO, 2003, p. 13). In the second case, the term minoritized language is sometimes used (Lewis and Trudell, 2008, p. 266). Vernacular refers to a language that is not formally recognized and that is used in informal contexts only. Th e term vernacular education has been used to refer to mother tongue-based education, particularly in the Pacific (Siegel, 1997; Litteral, 2004). UNESCO “promotes mother tongue-based bilingual or multilingual approaches in education - an important factor for inclusion and quality in education. Research shows this has a positive impact on learning and learning outcomes. International Mother Language Day promotes linguistic and cultural diversity and multilingualism, the theme this year is Linguistic Diversity and Multilingualism Count for Sustainable Development. This way we can aim to "ensure that all youth and a substantial proportion of adults, both men and women, achieve literacy and numeracy." Get your Dux in a row. Contact us today to become the best version of yourself.